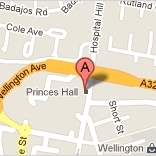 We love welcoming new and regular customers to the Princes Hall. Sometimes if you're coming along to see a show or attend an event for the first time, you might have some worries or questions. Here are the most frequently asked questions (and our answers), but please do feel free to make contact with the Box Office who will be happy to help. Do you have a baby change? female toilets on the ground floor. Hall whenever you are ready. the start time shown on your ticket. running late for the show. Do you have any booster seats? seats for very young children. your own booster seat or cushion. around and burn off extra energy!